GTECH G2 Casino Software and Games Provider are a Sweden-based software provider with a formidable presence in the gaming market. They are located, like all good things, in Sweden. Also, they date back to the very core beginning of i-gaming. Want to know more? Let’s take a look at this well-rounded company in more detail. You already know, the chances are, that there is a variety of parameters according to which we grade the casinos on our list. Payment systems, bonuses, security, and, of course, player opinions are all a part of them, as well as license and registration. 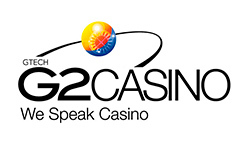 Gtech G2 is a leading software provider in the i-gaming market (at least according to most sources out there). G2 is the branch in charge of online gaming software development and it has been opened in 2009. The company itself has been in the business since, well, forever (1981) and to this day it is one of the best suppliers of quality games across the board. Gtech G2 has more than 400 games readily available to the public, and also some of the best connections around (they are the daughter company of Lottomatica). Gtech G2 is known for their unique slots and interesting storylines as well as remarkable bonuses. One of their most appealing features is intuitive navigation which just about anyone can understand and handle. Although a lot of their stuff is 3-reel slots, there are plenty of video slots to choose from. You can also choose from Flash or download the games onto your platform. Also note these games are TST-certified, which should put your mind at ease. We ask, as always, that you gamble responsibly, although in this case there is less of a need because this company has been on the market for so long you pretty much trust it all the way. Still, please read all the EULA all the way to the end and make sure you check out all of the conditions of bonus requirements.